Being in Southern California affords us the opportunity to work with a variety of different cultures and backgrounds. Over the years we’ve had many different cultures ask our catering service at De Luxe to create special appetizers for their reception, and it’s been a creative treat to prepare authentic dishes for them when they request this. Each wedding provides us with a unique challenge to give our guests the flavors that they grew up with and had at home. Here are several favorite wedding reception appetizers that we’ve had the pleasure to learn about. 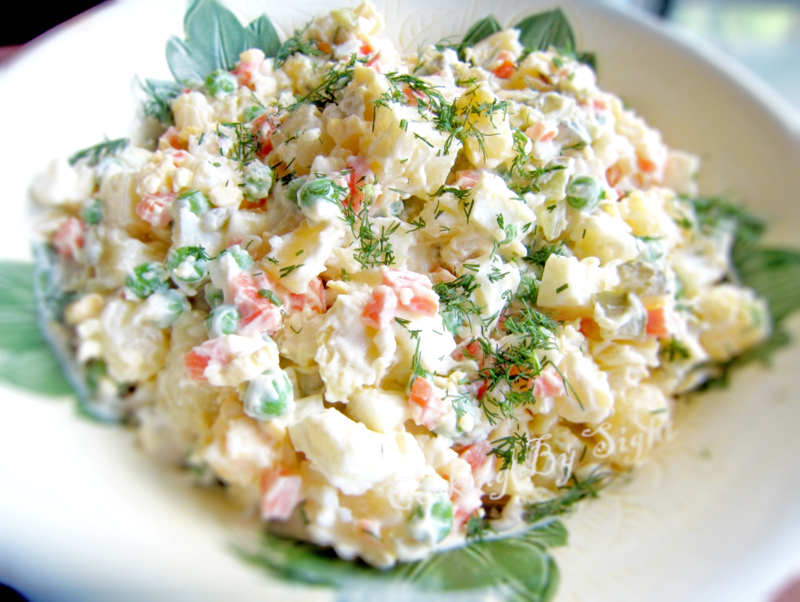 This potato salad is popular in Russia and many neighboring post-Soviet countries. This isn’t the typical potato salad that you might find in the U.S., but instead offers its own unique flavor that we absolutely love to make. Some of our guests will eat this on its own, but it’s most commonly eaten with a side of bread. This is one of the most popular wedding reception appetizers that we get asked to prepare—and with good reason. It’s incredible! This savory dip is no longer a regional secret. 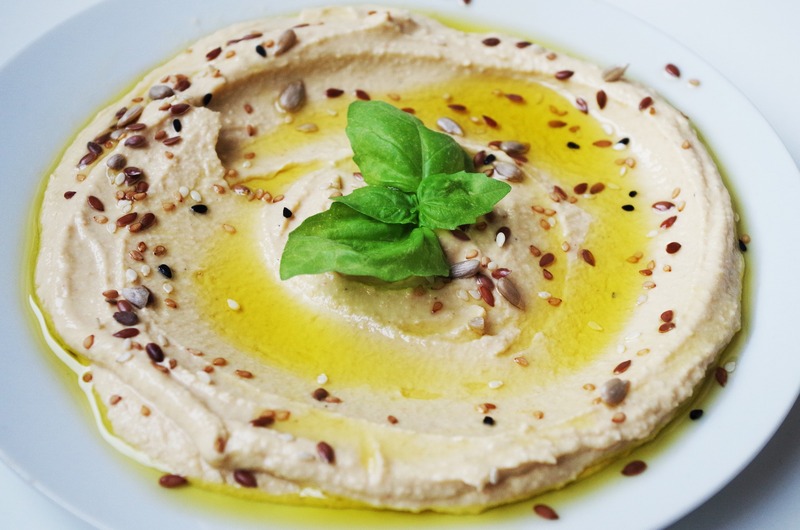 Hummus has become one of the most popular spreads/dips around the country thanks to it being both healthy and packed full of flavor. At Mediterranean or Middle Eastern weddings, this is one of the most common (and beloved) wedding reception appetizers that you’ll find. It’s becoming very trendy for American weddings as well. This delicious cucumber dip isn’t eaten just at weddings. It’s a staple at many Mediterranean and Middle Eastern dinner tables. This extremely versatile food can be eaten on its own, added as a side, or used as a dip. 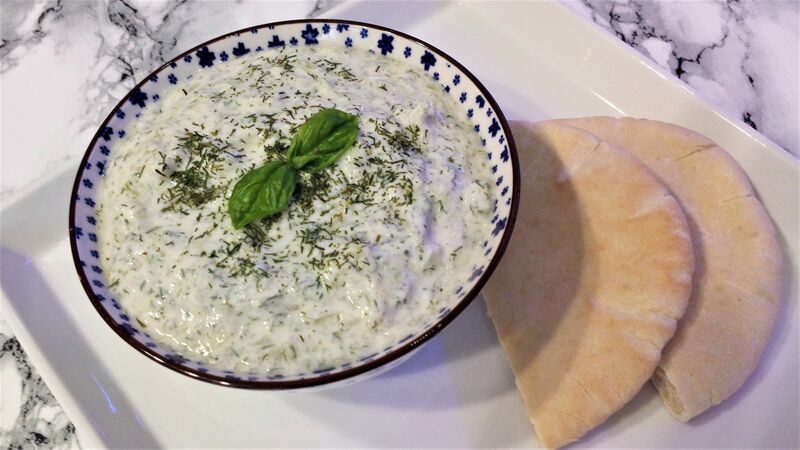 Many cultures have slight variations of mast-o khiar, the most popular being Tzatziki sauce made by the Greeks. We often see our guests dip slices of pita bread into this delectable dip. Another extremely popular wedding reception appetizer we’re asked to make is savory stuffed grape leaves, also known as dolma. There are a variety of countries that make these, and each country claims the recipe to be their own! But no matter who the originator is, our clients always ask for them. Dolma can typically be eaten by itself or with some bread. 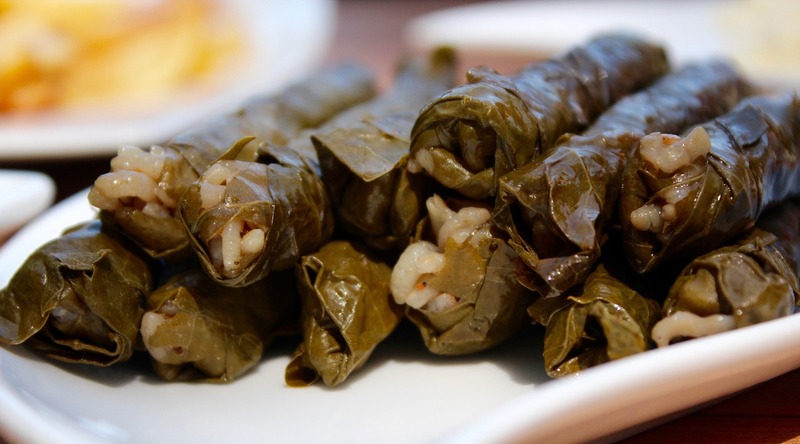 These leaves typically include meat, but there is a popular veggie variation known as sarma. This thin, flaky-dough pastry comes in a variety of flavors. The most popular one that we serve at De Luxe Banquet Hall is filled with cheese, but there are other variations that include spinach and feta cheese or ground beef. We contend that they’re all delicious! 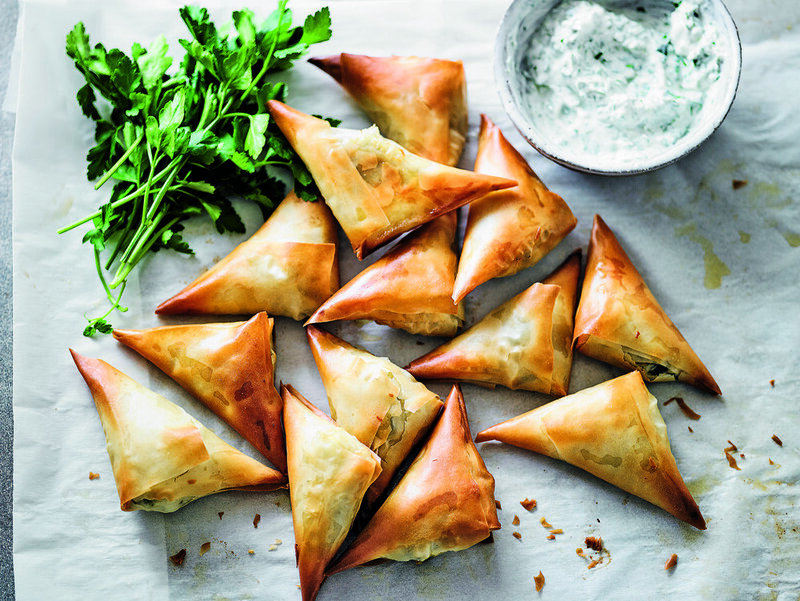 Börek is often a very simple recipe, but incredibly satisfying. 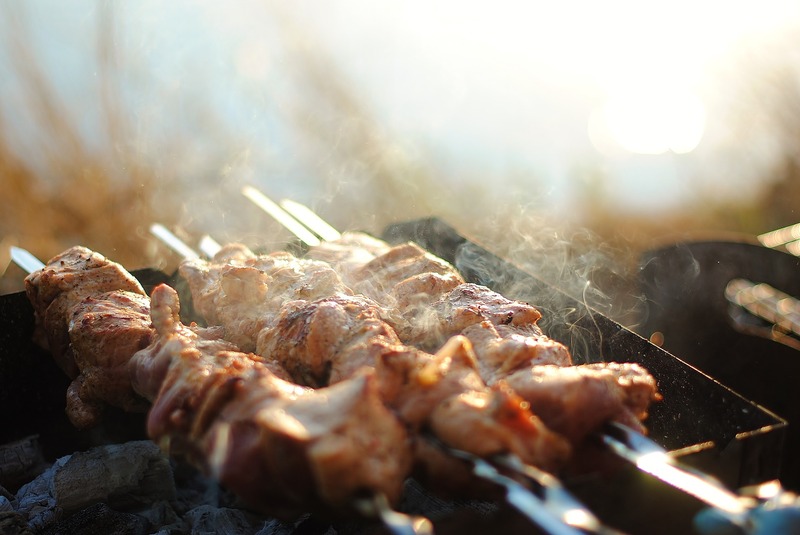 No frills here, just delicious marinated chicken grilled to perfection over a charcoal fire. Our guests often ask us what marinade we use when we make our chicken skewers for weddings, but we can’t let that secret out! Chicken skewers remain one of the most all-time popular wedding reception appetizers. 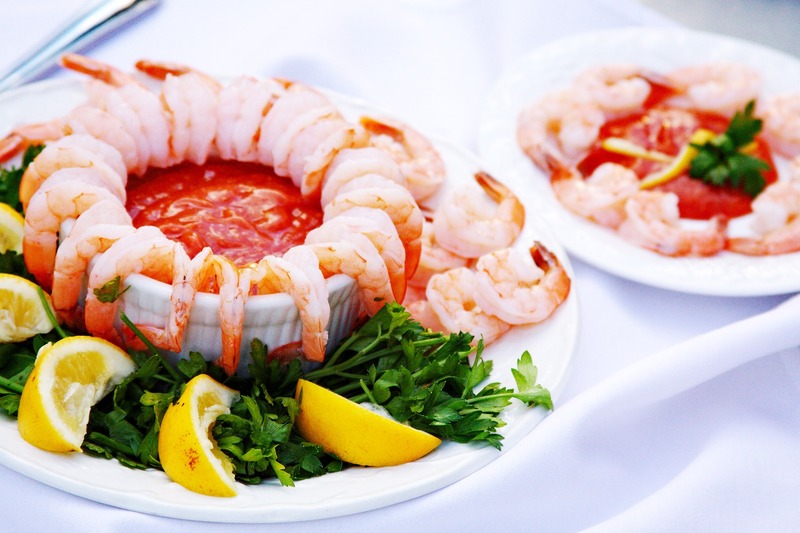 From time to time, a wedding couple will ask to have shrimp cocktails at the table as a wedding reception appetizer. Generally, we serve these family style, where each guest can grab as much or as little as they want. Shrimp cocktail is light, delicious appetizer that represents class and sophistication. 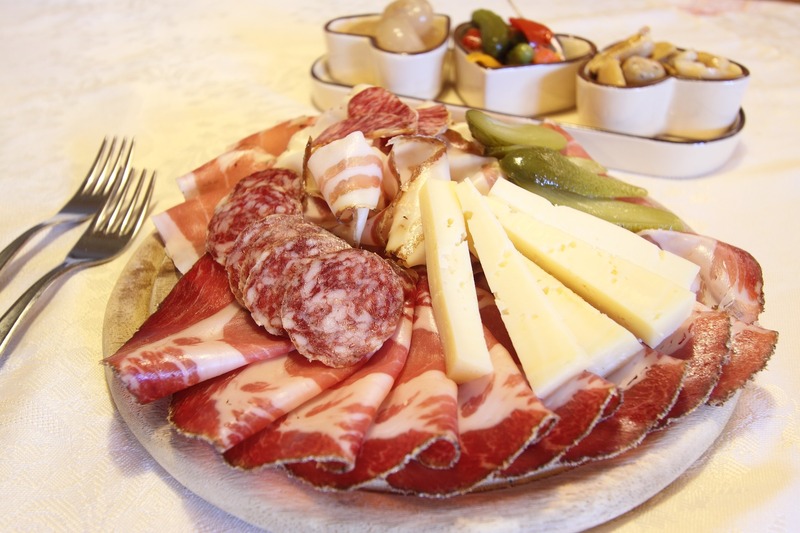 This wonderful antipasto offers a light and crisp flavor for our guests. 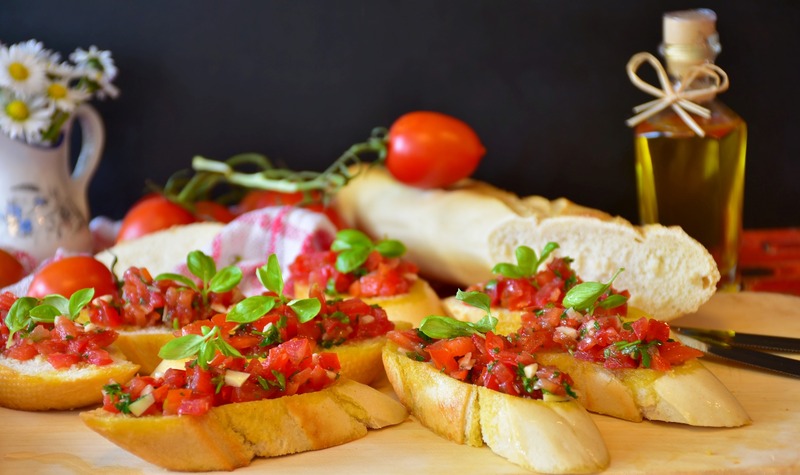 A medley of tomatoes, onions, and basil over a crunchy rustic slice of bread, drizzled with olive oil. Who could resist? Without a doubt, the overwhelming majority of our wedding couples request a charcuterie plate as one of their wedding reception appetizers. A typical wedding reception charcuterie plate includes a variety of delicious cheeses that pair perfectly with savory cuts of fresh deli meat. No matter what wedding reception appetizers you choose, you won’t be making a bad choice! Packed full of flavor and filling, we always want to give our guests the most authentic-tasting dishes that we can. This starts with the fresh products that we use to get just the right flavor. The food that we serve on your wedding day is extremely important, and that’s why we take extra care when it comes to not only the appetizers, but the entrees and dessert as well!